This is the season for seed catalogs and dreaming of spring and summer gardens. I decided to do the responsible thing and write up a seed inventory before I went on a seed buying spree. I now realize I may have a problem. I’m a seed and sprout addict. 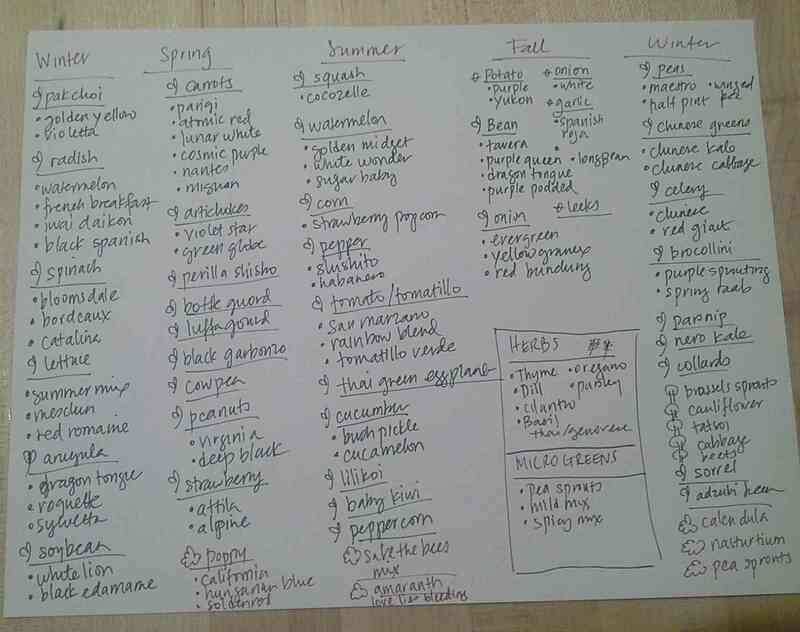 Here’s the list of seeds and sprouts (seedlings or bulbs) that I already have. The winter seeds are already planted but I haven’t even purchased any seeds for 2015 yet. I ran out of room on my paper before I listed the fruit trees I already have and the few that are still in transit (banana and goji berry). Can you tell Goji berry was a last minute shopping cart addition? And I ordered some ginger plants too. The catalogs are always so tempting aren’t they? Sadly, my garden is not as big as my imagination! 🙂 Best of luck on your garden shopping. Happy new year. Wow you have set yourself a huge task. Good luck! and Happy New Year. Thank you! I’ll need lots of good thoughts…and possibly more soil. 🙂 Happy new year! I so relate to falling into buying seeds and other garden supplies when left unattended at the store! As I recently posted on my own gardening blog, seed catalogs get me through the dreary winter months! I love browsing seed catalogs and looking through rows of gardening supplies. Despite my efforts to scale back this week, I gave in and just got a bay tree seedling! It was technically a gift, so I don’t feel as guilty. 🙂 I hope you are keeping warm with lots of catalogs to go through. When I had 5 acres to plant in I was a fanatical browser of seed and plant catalogues. There was always a huge amount of things I wanted to try. Now I have what amounts to a handful of flower pots full of herbs and strawberries. I don’t even look at the catalogues any more and I stay away from garden centres. Oh but I used to love it, brings back such sweet memories. Enjoy! I also need adult supervision when I go to the farm store or any place with a seed rack.